Who is CLI? 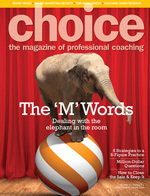 - Coaching and Leadership International Inc.
Home » About » Who is CLI? Coaching and Leadership International Inc. began in 1991 as a coaching, consulting and training company. In 1995, it became obvious to CLI that there was a missing piece to maximizing performance at work and at home. Leaders, employees and parents were having difficulty changing their unconstructive thoughts, words and actions into positive ones. Frustrated by the lack of tools to dramatically improve performance, CLI decided to go into research mode. Today, CLI is known for their development of The Science of Mind-Kinetics�. This science, which is a process for whole-brain thinking, literally puts the brain into action. It turns unconstructive thoughts, words and actions into permanent positive ones. The results from these unparalleled thinking tools are astounding. Indeed, in 2003 CLI won an award for innovative thinking through The Victoria Chamber of Commerce. CLI licenses their work to individuals and organizations who are also passionate about performance excellence. Outside of corporate, Counselors, Psychologists, Coaches and other helping professionals attend The CLI Training Centre to learn Mind-Kinetics tools in order to assist children, whole families, drug addicts and other physically and emotionally challenged individuals to lead happier, more peaceful and meaningful lives. Betska K-Burr and John Burr are Co-Founders of CLI. Betska is Co-President in charge of R & D and Training and is a best-selling author of many books "Creating Champions", "Flying by the Seat of Your ... Plans", "Build a Boooooooming Business" and "Superexcellent Selling". John, Co-President in charge of Sales & Operations, is co-author of "Build a Boooooooming Business", has vast experience in international corporations and walks his talk with respect to using both logic and heart to be a leader in his field. Together Betska and John head up a dynamic team which, they are told, "changes hearts". Licensees work diligently to become certified Power Coaches and CLI Trainers who then join John and Betska in business and government to lead their transformational programs.